232 Korean students enroll in Berklee College of Music. September. 12, 2018 07:55. imi@donga.com. “Although this is a small instrument that people see as a toy, I want to make my own music with students from all over the world,” said Choi Min-seok (age 30), who was accepted as the first ukulele player at the Berklee College of Music. Mr. Choi, who studied biology education at Seoul National University in Korea, became mesmerized with the charm of ukulele and worked as a ukulele instructor in Seoul. From this fall semester, Choi will study at the music school with his fellow students who are 10 years younger than him. It was easy to meet Korean students at the campus of the Berklee College of Music in Boston. Some 232 Korean students enrolled among the total 4,500 students as of this semester. As Korean students distinguished themselves in global stages along with the increased global presence of K-pop, the Berklee College of Music started to hold auditions every November for Korean applicants in Seoul. 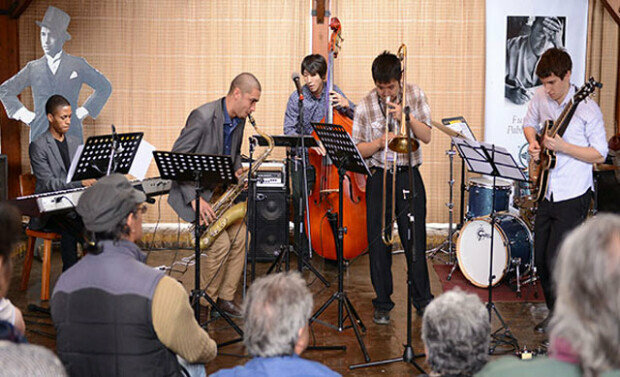 Starting from 2011, CJ Culture Foundation under CJ Group signed an agreement with the Berklee College of Music and initiated scholarship programs. CJ Berkley scholarship is granted to five to six students every year. The recipient of the scholarship is determined by eval‎uating those who need financial support among students with Korean nationality who are expected to enter the music school. This reporter met five freshmen who are recipients of the CJ Berkley Scholarship. Choi Min-seok was also one of them. “I looked into living expenses in the United States with my wife and it was quite frustrating,” said Mr. Choi. “Had I not received the scholarship, I would not have been able to dream with international students.” Kim Han (age 21), who entered the school as a vocal major, wants to study social music activities. “I hope my musical talent to be used for various social issues such as disabled people, sexual minorities, and abandoned dogs,” said Mr. Kim.